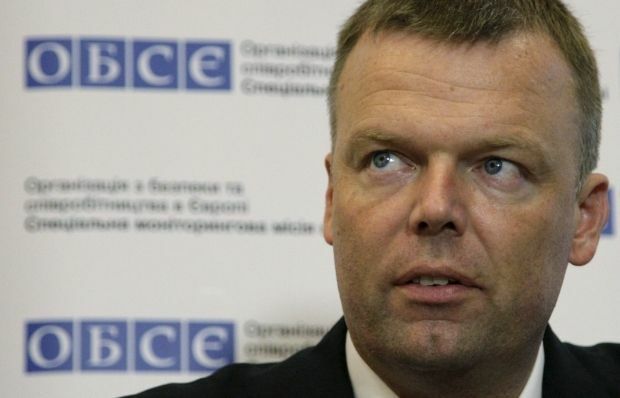 Principal Deputy Chief Monitor of the OSCE Special Monitoring Mission (SMM) to Ukraine Alexander Hug says the geography of violence has again been extended in Donbas. "We are deeply concerned that the geography of violence has again been extended to areas in southern Donetsk region. In Kominternove, on April 9 the SMM heard at least 15 undetermined explosions in a two-minute period. On April 13, while my team and I were in the area, within an hour – some 17 explosions were recorded," he said during a skype briefing from Observations Point No. 1 at militant-controlled Donetsk's central railway station, overlooking the Donetsk airport, on Friday. According to him, the level of ceasefire violations registered by the SMM remained consistently high. "The area of government-controlled Avdiyivka and so-called 'DPR'-controlled Yasynuvata remained the most volatile with the majority of violations in Donetsk region recorded there. On April 8, the SMM recorded 979 undetermined explosions and multiple bursts of small-arms and heavy-machine-gun fire. Just yesterday [April 14] in the Donetsk region the SMM recorded a total of 4,372 CFV [cease-fire violations], reflecting a sharp increase in fighting in the Avdiyivka/Yasynuvata area," Hug said. The OSCE monitors report that on both sides of the contact line there are more and more weapons absent from the sites they were once withdrawn to. "It is thus no surprise that the SMM keeps seeing weapons in use and in violation of respective withdrawal lines positioned inside populated areas on both sides of the contact line," Hug said. In his words, in the militant-controlled city of Luhansk, the SMM saw seven tanks, seven multiple launch rocket systems (BM-21 Grad, 122mm), ten towed howitzers and seven self-propelled howitzers. "The so-called 'LPR' claimed they were committing this blatant violation because the weapons are to be used for a May 9 parade," he said. Hug says that such exceptions are not foreseen in the Minsk agreement. "Such movements of weapons are a direct threat to civilians," he said.